An ‘attractive’ new roof structure. 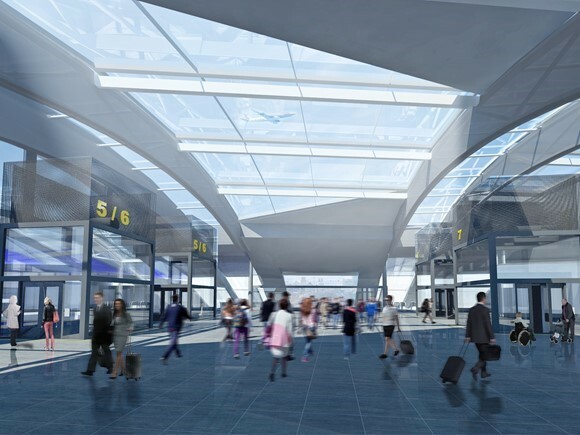 Guy Stephenson, chief commercial officer, Gatwick Airport, said: ‘More than a million local commuters and business people also use the station each year and will benefit from this fantastic example of the public and private sector working together to deliver a world class transport hub. The station serves 19 million passengers a year – up from 7.5 million 20 years ago. Network Rail said the plans will accommodate forecast rail growth up to 2036. The proposals were submitted by Network Rail, in partnership with Gatwick Airport Ltd, Coast to Capital Local Enterprise Partnership and the Department for Transport. Network Rail said it expects the council to determine the planning application this spring, with funding parties making a final decision on the project in the autumn. Construction would begin in 2019 and the project is due to be completed in 2022.